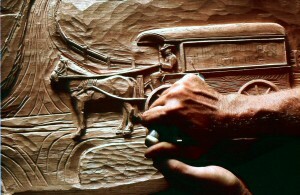 Chuck Dorr started carving in 1971 while taking a class in wood carving taught by Paul McCarthy, a friend he was working with for carpentry and house painting. He loved it so much and picked up the techniques so quickly that he talked the instructor into starting a business together. 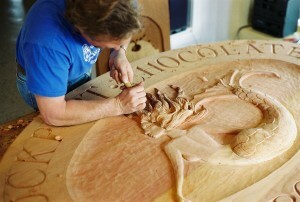 The business was called “The Carving Place,” located in Scituate, Ma. Chuck met his future wife Dale that year also. Paul and Chuck were partners for four years. Chuck was going to go on his own but he decided to team up with sign carver David Hassan in the next town. This business was named “Cohasset Woodcraft Carving Shop.” Their work flourished, they both strived for perfection and raised each others skill levels. Their goals were the same; quality,consistency and the strive for perfection. After seven years Dave and Chuck parted ways. Chuck and Dale were married in 1972 and had two children, Luke and Sandi. They all moved to Appleton, Maine in 1985, where Chuck worked out of his house, hand carving signs and establishing a client base as well as having his art work adorn local businesses, and homes. 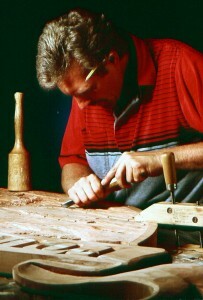 In 1992 Chuck and Dale purchased an old house on Route 1 in Rockport, Maine, renovated it and built a new large shop, now the home of Dorr Woodcarving & Sign Co.
Chuck and Dale’s goal is to have the customer enjoy the process of working with them and having the customer love their sign as much as they do when it is completed. Their motto is “A quality business deserves a quality sign.” There is nothing like the satisfaction of the finished product and a happy customer. Contact us today by phone to talk about your quality sign project.